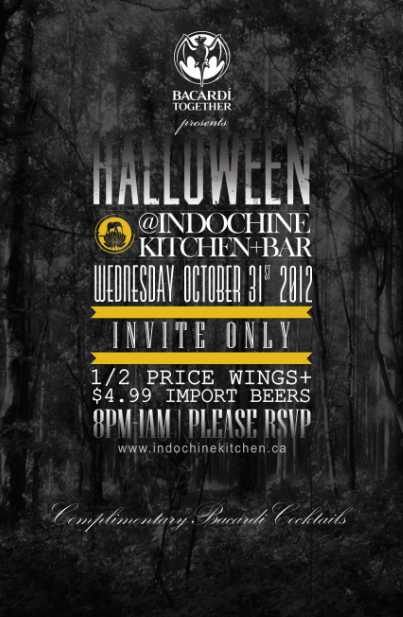 Still looking for something to do on Halloween? Want to avoid paying ridiculous amounts of money going out to a ridiculous Granville Street Bar? You’re in luck! I have two VIP passes to give away for this ‘invite-only’ event so if you would like to dress up and enjoy some complimentary Bacardi cocktails on Halloween enter my last-minute contest. I look forward to giving these away to some awesome people so I can drink some cocktails with you at Indochine Kitchen & Bar. Happy Halloween! My favorite Halloween movie would have to be It’s the Great Pumpkin, Charlie Brown but my favorite horror movie is Rosemary’s Baby.